Because this is an online blog, we write a lot here about designing for the web – what interfaces to use, how to handle menus, what responsive design means. But the truth is that design is still needed in every other facet of our life, too: from the mugs, we drink from to the cars we drive, everything is designed. Most especially from the perspective of a design agency like us, print is still a vibrant channel for wonderful design. For many of our clients, for example, their website has not replaced their print brochure. The two certainly share a relationship which impacts upon the purposes of both, but neither can quite do the job of the other. 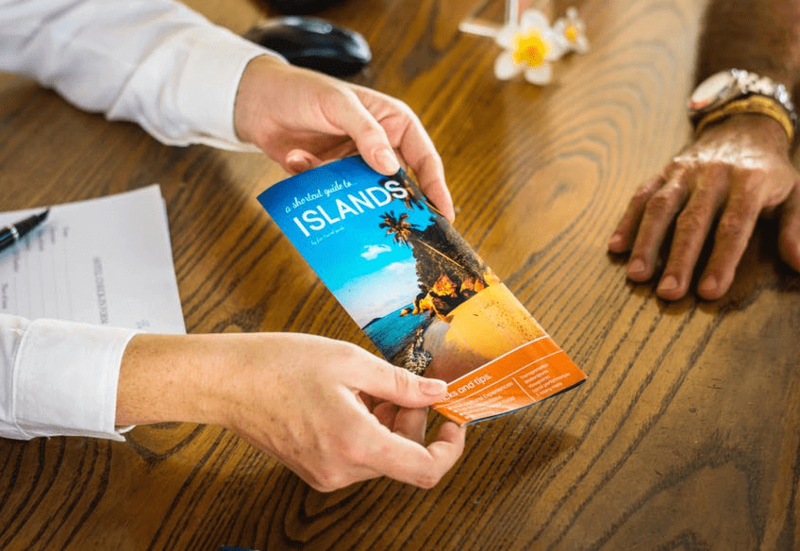 In physical contexts of all sorts, from trade shows to sales meetings, your brochure acts as a package of introductory material for your business: customers will get to know you through your brochure. That means it matters. Print design makes very different demands for web design. You should find an agency that specialises in both. There are key considerations with any format, and print brochures are no different – find a designer who gets that. As an example of some of the factors influencing what makes a good brochure, you – or your designer! – should bear in mind the following. Know the Print Specifications. Unlike computer screens, brochures have finite physical properties. Get to know the exact specifications of your brochure: consider the paper size, the folds, and the content bleed. For thicker booklet brochures, an assembly of pages might be a smart approach. Know your Audience. Distributing your brochure to the right people ensures less waste in resources and a better conversion rate. Identifying an audience also means you can select the right size and format for them: for stakeholders, you might opt for thicker and more robust brochures; for prospective clients on the go, smaller brochures that can fit into pockets and bags might be a smarter pick. Stick with Quality. Quality becomes quite evident when it comes to print materials. That means you need to think quite carefully about materials, of course, but also the images on the brochure. They need to be high-resolution and sharp. Generally, images and elements should be at least 300dpi on screen. There’s little worse than a blurry image in a brochure. Consider Texture. The physical features of a brochure can help them be more memorable- and part of that is the tactile experience of reading them. Texture can also make the brochure more visually appealing to readers, standing out from the crowd. Some effects to consider include: foil, letterpress, die cuts, spot UV and more. Careful Design. Consider how you want to present information to your readers without it becoming overwhelming. Brochures shouldn’t be encyclopedias! Call-to-actions (CTAs) should be used to help funnel your readers to a conversion or a goal. It’s good to repeat the CTA throughout the brochure, to enhance your structure and provide good way-finding. Navigation isn’t just for websites! Proofread It! Typographical errors can be expensive to fix when a brochure has already gone to the printers. Make sure you are 100% happy with the content and that there are no errors before printing to reduce the risk of unexpected costs. There’s no quick ‘Edit’ feature on a printed item. In other words, brochures are very much their own beast. We love designing them – they can be wonderful objects and exciting reads. Don’t leave yours as a second thought – drop us a line today about how to make your print design as exciting as your online efforts! If you need to design a brochure, then please speak to our friendly experts. Our brochure designers are based in Coventry, Warwickshire and are always ready to help. Please feel free to contact us on 024 7683 4780 or send us an email at info@image-plus.co.uk.